PARIS -- PSA/Peugeot-Citroen said first-quarter revenue fell 7.3 percent as the region's vehicle market contracted. Quarterly revenue fell to 14.29 billion euros ($18.9 billion), with automotive division sales down 14 percent to 9.72 billion, PSA said today. "The competitive environment remained difficult during the quarter, with pricing pressure similar to the last quarter of 2011, and markets in southern Europe worsened considerably, with an unfavorable impact on the group's country mix," the carmaker said. "This environment should last throughout the first half of the year." PSA set up a vehicle-development alliance in February with General Motors Co. in an effort to address overcapacity and shrinking profitability. "The results are bad, but they are not worse than expected, so that's a relief," said Kristina Church, an analyst at Barclays Bank Plc in London. "The market had been assuming that the pricing would be worse. Management said that they were more confident for the rest of the year, and they sounded on top of the crisis." PSA said it has achieved about half of a 1.5 billion-euro asset-sale plan while making progress on a spending- reduction program of 1 billion euros, and net debt will probably decline "significantly." Industrywide first-quarter car sales in Europe dropped 7.3 percent to 3.43 million vehicles, according to the region's automakers association ACEA. PSA was the third-worst performer among the region's major carmakers, with sales falling 17 percent to 407,792 cars. That contrasted with Volkswagen Group, Europe's largest auto manufacturer, which posted a sales increase of 0.5 percent to 813,522 vehicles. All major carmakers except Volkswagen lost money in Europe last year. Declines in Europe and Latin America led PSA's drop in first-quarter deliveries. The company's Chinese car and light commercial-vehicle sales increased 6.3 percent to 109,100 units, while Russian deliveries jumped 22 percent to 19,100. Inventories at the end of March amounted to 70 days' supply, compared with 58 days a year earlier. The company reiterated forecasts that the European market will shrink by 5 percent this year, including a 10 percent drop in France. Industrywide car sales will probably rise 7 percent in China, 6 percent in Latin America and 5 percent in Russia. In an effort to reduce the group's dependence on saturated European markets, CEO Philippe Varin is pushing an ambitious Chinese expansion led by higher-end Citroen DS models soon to be launched in China and shown this week at the Beijing auto show. PSA said it was targeting 5 percent market share in China for its Peugeot brand by 2015. It is aiming for a 3 percent share for Citroen. A goal of reducing procurement spending by 400 million euros has been 80 percent completed, PSA said in a separate presentation. Another 600 million euros in fixed-cost reductions is targeted, with 300 million euros in administration, 100 million euros in research and development and 200 million euros in manufacturing, it said. 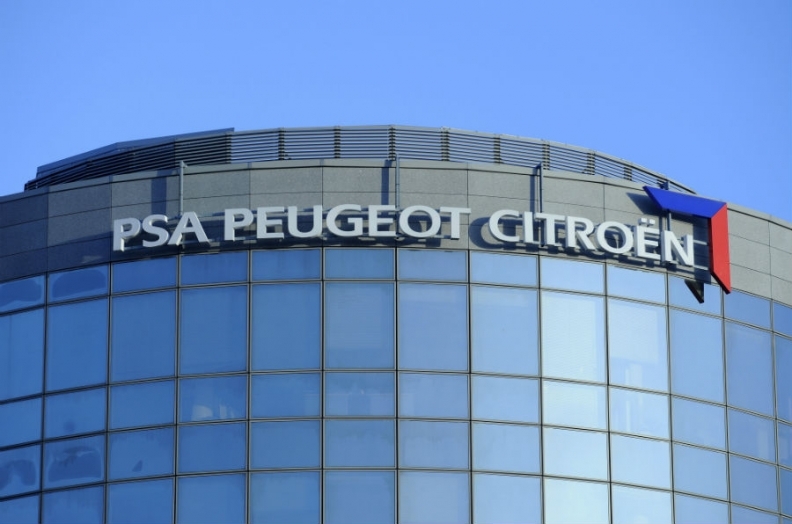 Asset disposals have included the Citer vehicle-rental unit that the carmaker sold to Enterprise Holdings on Feb. 1 for 440 million euros and the planned sale announced April 2 of PSA's headquarters building in Paris to Ivanhoe Cambridge for 245.5 million euros. PSA is having "very open" talks with private-equity firms and hedge funds as possible buyers of its Gefco trucking unit, Chief Financial Officer Jean-Baptiste de Chatillon said today on a conference call. The division has a "very good market value," and PSA has yet to decide on the size of the stake in Gefco to be sold.